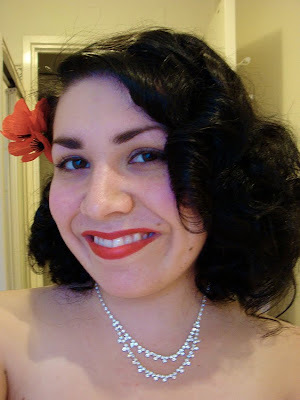 Outfit details: poppies - for Remembrance Day; diamante necklace - Diva; 1950s cotton dress - Exclusive Vintage; diamante bracelet - Diva; silver shoes - Payless. Anyway, the night was quite a success. I managed to sell one of my photos (it was 'S Wonderful, for those of you who are interested) practically immediately! I arrived just as the exhibition was officially meant to open and the first thing I saw was a little red dot next to my work. I'm not sure who bought it, yet, but it's encouraging to know someone else loved my work enough to actually want to own it. Here's hoping I sell the other two pieces. After the show I headed down to the Casino, again, to see Lucky Seven with a friend from swing dancing but we only stayed long enough for one set, which was better than not seeing them at all. They're having a Tiki themed night in a couple of weeks which I'm rather excited about. 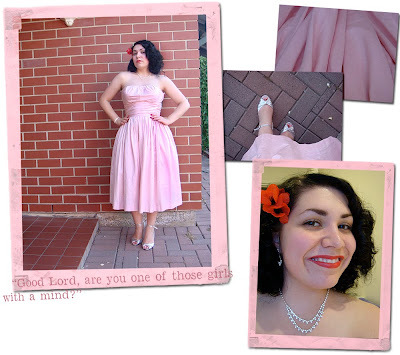 I am currently quite exhausted (I actually had to have a nap when I got home today) but this dress has inspired me to put together a little post about all of my favourite vintage things of the pink persuasion, so keep a look out for that! what a gorgeous dress! and congratulations on the sale! Oh Andi! The dress is gorgeous. Congrats on the sale, and of course your graduation! HAPPY DAYS!!! The lighting in your graduation shots is great. Your pink dress is lovely! I had a look at your pics on Flickr and theyre very lovely, i love all the dresses in the photos too! That is a great dress! I'm so glad the opening went well! Congrats on the sell! And you look really stunning! oh that is simply beautiful indeed! You look so gorgeous, this dress makes ur skin sing. Your adorable! Oh you look so pretty! Love that!! That is one fabulous frock! Congrats on your graduation! It really is perfect, you look lovely! Congratulations on your graduation! Ooh, that dress is Darling! Oh it's beautiful! You look so marvelous. I am sure your other two photos will go like the hot cakes they are! It really is a marvelous dress! The cut and colour suit you brilliantly, Andi dear. You look like a stunning Hollywood starlet of yesteryear in this gorgeous pink frock. Many happy congrats on your graduation exhibition, and best wishes for the next stage of your life, my friend. Big congrats to the sale!!! :) And I ADORE that dress. I am so jelous right now. Gorgeous! And congratulations on the sale!